If you’re one of the entrepreneurs considering a garment decoration startup. you may be overwhelmed with the different methods the market has to offer. We’re here to help you cut thought the clutter. If you’re on a small budget, please hop over to our T-shirt printing options in the under $5,000 article. If your ambitions are a little higher, this one’s for you. We’ll broaden the horizons a little and see what advantages one might gain from an initial investment in the five to ten thousand dollar range. To keep it simple, we’ll stick with sublimation, laser transfer, heat presses, and print and cut packages. Generally speaking, what makes these packages more expensive is the fact that they’re based on larger, or specially engineered printers. What do you gain from investing in larger printers and better heat presses? Productivity, economy, or versatility? If you want to invest in T-shirt printing and have the budget for something in this price range, the first thing you should consider is a top quality heat press. This decision alone can add as much as $2,500 to the initial equipment cost. But the advantages in terms of speed and consistency are worthwhile, especially for laser transfer. Some of the more advanced presses, like the Digital Knight DK20-AR can be automatically opened and closed, preventing accidentally burned shirts. This is a lifesaver in a busy shirt shop. Speaking of laser transfer, we’ve already noted that the two-step papers used for dark garments work better with a swing away press than with clam shells. Another way to optimize consistent transfers with these papers is to use an automated swing away press that allows precise control of the pressure setting. The final step with the two step laser transfer papers requires heavy pressure. What’s ‘heavy’ depends in part on the upper body strength of the press operator. There’s a fair amount of opportunity there for subjective error. Using a press that allows you to set the pressure at a specific- and repeatable- PSI standard will yield more consistent results and reduce waste from botched transfers. Two options in this category are the Geo Knight DK20S and Stahl’s Hotronix Air Fusion . Both are high quality presses that will improve your consistency and support high volume shirt production. Compressed air is required. Since dye sublimation is the most affordable of our T-shirt printing options, one might expect it to be difficult to spend more than $5,000 on a sublimation system. And one would be right. 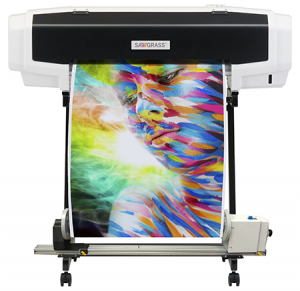 If you love desktop sublimation and want to expand your options with a large format system, you can find several wide format sublimation systems in the $5,000 – $8,000 price range. The Sawgrass Virtuoso VJ628 offers the same ease of use and quality found in the desktop printers in a more versatile wide format platform. 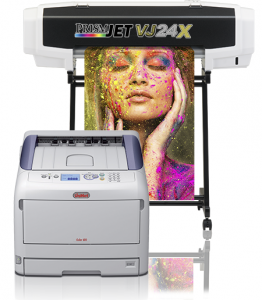 The VJ628 is a 24″ printer based on the MUTOH VJ628/PrismJET VJ24, a printer known for its rock-solid reliability. Sawgrass chose the MUTOH print engine to bring improved levels of reliability and ease of use to the wide format sublimation market. The Virtuoso VJ628 comes with several ink configurations including an economical DUAL CMYK setup and an eight color Pro Photo configuration designed to produce maximum gamut and print quality. Advantages: The advantages of a large format dye sublimation system can be summed up in three words: speed, size, and economy. Larger wide format printers outperform desktops in production speed. A Virtuoso VJ628 in produces high resolution 720 x 1440 dpi transfers at a rate of 57 square feet/hour. That’s about 40% faster than a Virtuoso SG800 desktop printer in Quality mode. And wider format prints mean you can consider sublimating raw polyester, then having it cut and sewn into a finished product instead of adding a sublimated transfer to an existing garment. A fully sublimated shirt should command a higher price than one with an added transfer. Speaking of price, the other advantage of going big with sublimation is the lower ink cost produced by using larger ink cartridges and bulk ink systems. For example, the estimated print cost for Virtuoso VJ628 is only 27¢ per square foot as opposed to 63¢ for a Virtuoso SG800. That’s a 57% reduction in cost. Disadvantages: The disadvantages of large format sublimation are the same as those of the desktop variants. You’re still limited to using white polyester or polymer-coated substrates. And flooding a sheet of white polyester with a full width print that makes it look like you’ve decorated a black shirt only uses more ink. And even at 27¢/sf, the ink cost of a large format sublimated print is two to three times higher than the toner cost of a laser transfer, and five times higher than screen print. But if you love the softness and quality of sublimation and want to make it bigger, faster and slightly more affordable, a large format system might suit you well. The star attraction for laser transfer in this price range is the new iColor 600. Like the iColor 500 we mentioned in the previous article, the iColor 600 uses a unique five toner setup comprised of CMYK plus Fluorescent White. The Fluorescent White toner serves as the under-base that allows your process color image to look correct on dark and colored apparel. The result is a full color photo quality image with opaque white and vivid color no matter the color or fabric of the garment. The addition of a Black toner cartridge gives iColor users the ability to print rich black on white apparel, an option not present in the similarly sized OKI PRO 920WT. 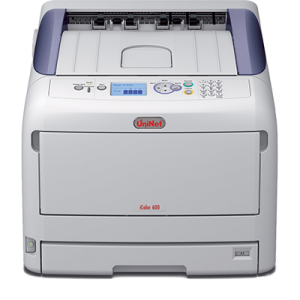 Speaking of competitive advantages, the iColor 600 comes standard with the iColor TransferRIP software which is a $649 option on the iColor 500 and OKI WT printers. TransferRIP enables single-pass CMYW printing and adds several powerful color management tools. TransferRIP also gives you more freedom in choosing a graphic design platform. The TransferRIP screen option softens transfers and saves money. The OKI WT print engine only works with Photoshop and requires the use of clipping paths that can add considerable time and complexity to your design work. With TransferRIP, all you need is a single layer image with a transparent background. These can be generated in a number of different design applications including FlexiSign or LXI Master Plus. The coolest TransferRIP trick is the rasterization screen option, which converts solid layers of toner into halftones. The halftone conversion produces a softer, more flexible transfer. It also reduces toner cost by up to 40%. It’s the ideal solution for customers who want the versatility of laser transfer and the softness of screen printed apparel. The iColor 600 handles both letter and Tabloid (11″ x 17″) sheets of laser transfer paper so it’s the natural upgrade for decorators using a desktop printer like the iColor 500, Oki C831, 711WT or GO UNO. The iColor 600 starts at only $6,995.00. Advantages: Relative to the OKI PRO 920, the iColor 600 offers the obvious benefit of five toner cartidges. No more washed-out blacks. The added cost advantage of bundling TransferRIP with each printer gives iColor 600 users powerful design tools for which Oki users must pay extra. Compared to the iColor 600, the advantages are larger transfers and the bundled RIP. The larger toner cartridges also reduce the image cost making it a more cost-effective solution. 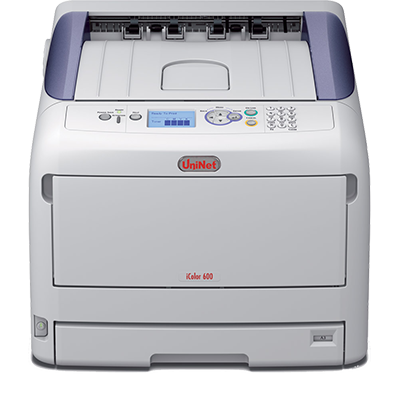 Disadvantages: Like its smaller sibling, the iColor 600 requires a swing away heat press for consistent transfers. But it need not be a fancy one. A humble EnduraPRESS SA12 will do for starters. But for efficient production, you’ll want to invest in one of the more advanced models discussed above. And the two-step papers required for decorating darks require a little practice to achieve consistent results on the first step. But if you’re looking for a dark garment solution that produces screen print quality softness without the use of white ink and pre-treated shirts, a white toner laser printer may be the best fit. The PrismJET VJ24XF option brings eye-popping color to your T-shirt transfers. The entry level print and cut T-shirt printing packages are among the most flexible options due to their ability to work as standalone T-shirt printing systems or to enhance sublimation or laser transfer. Investing in a more advanced print & cut package only enhances that versatility by adding a myriad of profitable applications to your printing portfolio. The PrismJET VJ24 is an exciting blend of space efficiency and productivity. Its maximum 24″ print width is more than sufficient for custom apparel, but is small enough to be used in a standard office space. It uses a dual-CMYK ink delivery system for long print runs, but uses standard 220ml ink cartridges for better economy. And at print speeds of up to 435 sf/hour, it’s a champ at cranking out color. The MUTOH Eco Ultra ink prints to a wide variety of coated and un-coated substrates including most digitally printable heat transfer films on the market. And a print and cut package with a heat press can be yours for under $9,000. 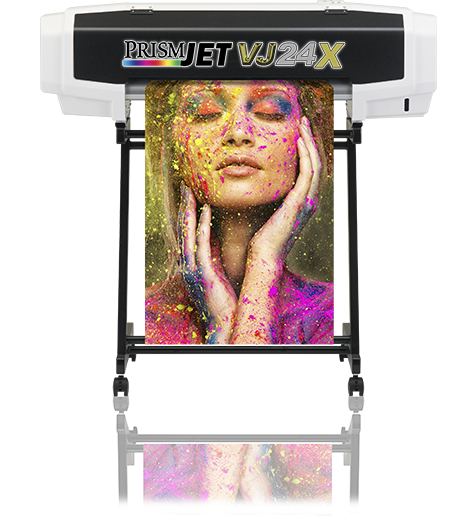 If you want a wider color gamut and would like to ‘Wow’ your customers with eye-popping tie-dye quality T-shirt transfers, the new PrismJET VJ24XF might be your choice. The VJ24XF is based on the eight-color VJ24X, which comes with CMYK, Light Cyan, Light Magenta, White and Metallic ink. The VJ24XF print & cut package replaces white and metallic with Fluorescent Pink and Fluorescent Magenta ink. These can be blended and overlain in your design software to produce a range of neon hues. The cutting is done by the EnduraCUT 3 and its advanced AAS II contour-cutting firmware. Advantages: In keeping with the versatility of the print and cut systems reference in our ‘under $5,000’ article, the PrismJET VJ24 and VJ24XF offer profitable possibilities beyond garment decoration including signs, banners, fleet graphics, and all kinds of posters and decals. Their other advantage is the relative ease of the heat transfer application, compared to laser transfer. Solvent-printable ‘T-shirt vinyls’ must be cut and weeded, but they’re much more forgiving than self-weeding transfer papers. All of the various T-shirt printing methods we’ve discussed have strengths and weaknesses. To help you sort out the pros and cons, we’ve devised a chart that compares all of these methods side by side. For each method, there are hard numbers like start-up cost and average operating costs. Each is also ranked on a scale of one to five for ease of use, versatility, durability and more. You’ll probably find that not one method fits all your needs perfectly. So you’ll need to prioritize what metric is most important for you. If you value versatility above economy, sublimation may be the wise choice. If decorating dark garments is a must, you may be better served with a laser transfer or print and cut process. And if versatility and ease of application are your priorities, a print & cut system may be your best bet. Click here to view or download the comparison chart. We hope you find it to be a useful decision-making tool. Many a successful business starts on a shoestring. But if you want to get to your goals more quickly, it only makes sense to invest in a more advanced package. 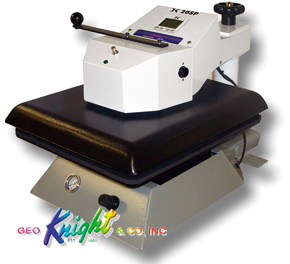 Include a more robust heat press that supports your production targets. Consider the other possible applications for your T-shirt printing equipment, and don’t limit yourself to letter and tabloid sized prints. Often a bigger initial investment yields bigger prints, faster production, and lower operating costs, all of which add up to faster returns and substantially better long-term profits.